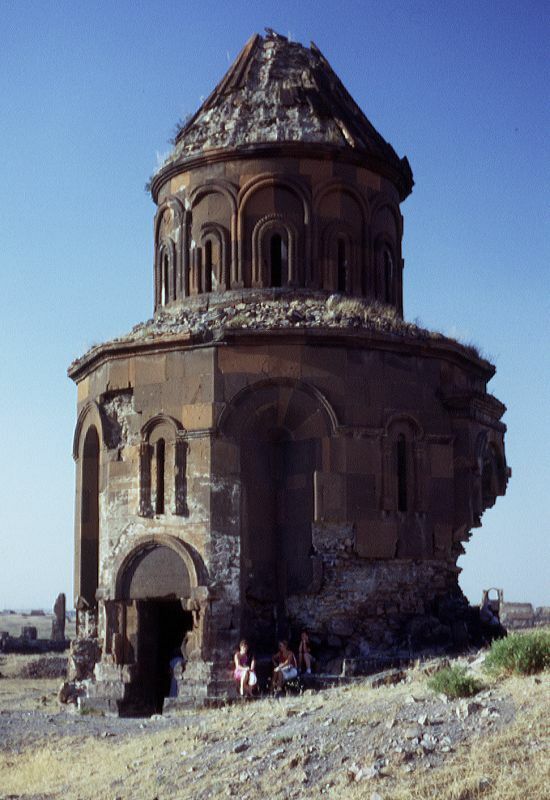 "In the year 489 (AD 1040), I, Ablgharib, marzipan of the Armenians, son of Grigor and grandson of Abughamir, although I was neglected by my father because of the fact that I was the younger son, was nonetheless moved by love for my parents to restore this place of repose for my father Grigor and my brother Hamza and my sister Seda and built two chapels, St. Stephanos and St. Kristapor. And the condition for the priests is this: that every Friday in St. Stephanos they hold a religious function for my mother Shushan and every Saturday for my father Grigor, and in St. Kristapor every Friday for my sister Seda ..."
This small church stands at the edge of a steep slope overlooking the Tsaghkotsadzor (Alaca çay) valley. 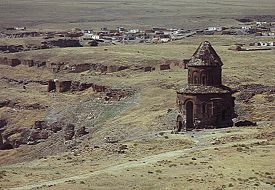 It is interesting that almost all the churches in Ani have been constructed very close to the edge of the plateau, as if they were designed to be seen best from outside the city. 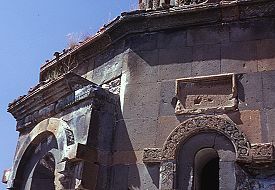 It is thought to date from the late tenth century - many of the building's features are typical of this period - and to have been commissioned by Prince Grigor Pahlavuni as a private chapel for the Pahlavuni family. 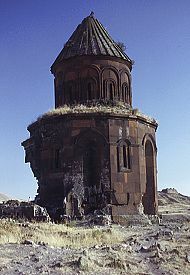 This family rose to great importance during the final years of Ani's independence; the most famous was Vahram Pahlavuni, the leader of the faction that opposed Ani's incorporation into the Byzantine empire. 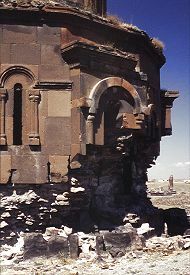 Vahram is mentioned in an inscription carved on the tympanum over the doorway telling that he set aside money to pay for masses for the soul of his son Abughamir (hence the name of this church). The plan on the outside is twelve sided. Each side alternates between having deep niches and small windows. On the eastern facade, because of the chambers that flank the apse the two niches are shallower. They are inserted into rectangular, portal-like structures that protrude from the facade. The lower parts of these unusual extensions are lost, but they probably contained something of importance: perhaps khatchkars or inscriptions, or they marked the site of graves. The single entrance is on the south-western side, not on the west side along the usual east-west axis. This was perhaps so that the door did not open onto the edge of the cliff but onto an open courtyard. At a later date some sort of covered porch was added to the entrance, this has entirely vanished except for a few blocks of masonry and the traces of concrete stuck on the wall above the doorway. On the upper parts of the church, the windows in the cylindrical drum are framed by mouldings that form double sets of blind arcades - an unusual design. The conical roof above the drum has a steep pitch and is thus probably from a later restoration, or the church is actually from the early eleventh century. The variety of forms used in the facade (especially those portal-like extensions with their elaborate cornices) and the play of light and shade upon them gives this church an almost Baroque feel to it. The design of the interior is not at all predictable from an outside view, and it is surprisingly spacious. The church has a centralised hexafoil plan - six apses of exactly 3/4 of a circle are grouped around a central space. 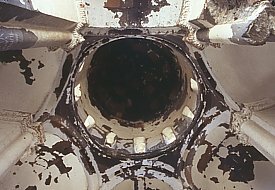 Above this, resting on pendentives, rises a cylindrical drum that is lit by 12 windows and topped by a semicircular dome. 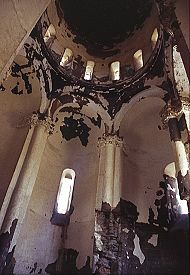 There are feint traces of frescoes on the roof and walls of the altar apse. These are later in date than the church and are probably from the thirteenth century. The altar apse is flanked by tiny chambers, probably chapels. 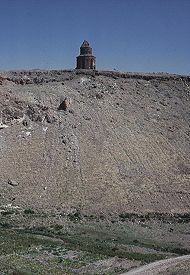 The rather battered walls have a buff-coloured whitewash on which is a large quantity of graffiti in Armenian, Russian and Arabic from the late nineteenth and early twentieth century. 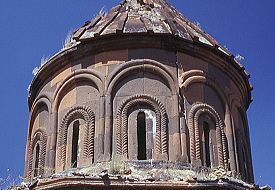 Perhaps this church had a symbolic importance to these visitors because of its connection with the heroic Vahram? An inscription from 1040, the one partly reproduced at the top of this page, states that Prince Ablgharib erected a sepulchre, comprising two rooms, for his father, brother, and sister. 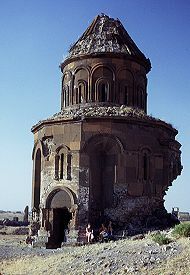 Since Vahram Pahlavuni died in battle in 1047 it is possible that he also was buried within it. The foundations of this sepulchre adjoin the north side of the church. It was excavated in 1907. In 1998 its floors were broken open by treasure hunters. That there were intact graves buried underneath is certain because of the many fragments of human bones that were scattered amongst the debris the treasure hunters left behind. There were at least three separate graves, each sealed with a thick covering of concrete. In 2004 the foundations of the sepulchre were completely cleared of soil. It is an L-shaped structure. At the corner of the "L" is a chamber with a square plan. 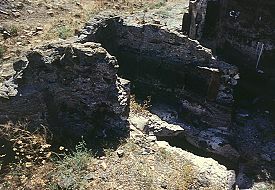 To the south of this chamber, and between it and the north wall of the church, is a small room with a semicircular apse. To the east of the square chamber are two more small rooms, arranged side by side (see photograph 10). One ends in a semicircular apse, the other is rectangular. This page [Church of the Abughamrents] was first published in 1999. It was last modified on the 5th February 2005.